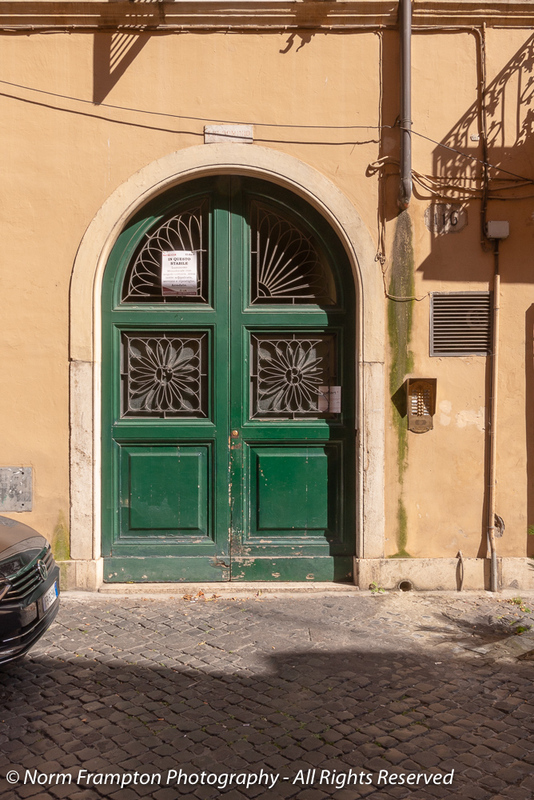 Here’s another assortment of original and interesting doors, and door hardware, captured on one of several doorscursions from our recent visit to Rome. Not much in the way of history or fascinating stories to tell in this post. 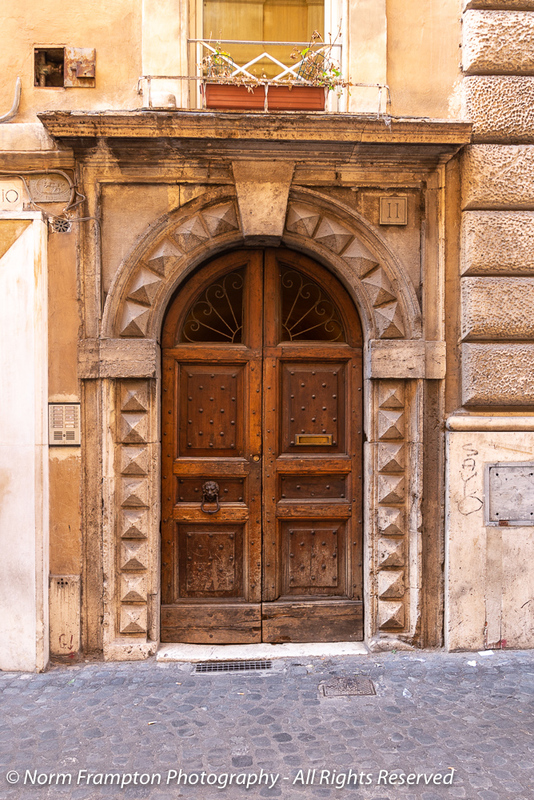 Just a lot of lovely doors begging to be photographed. 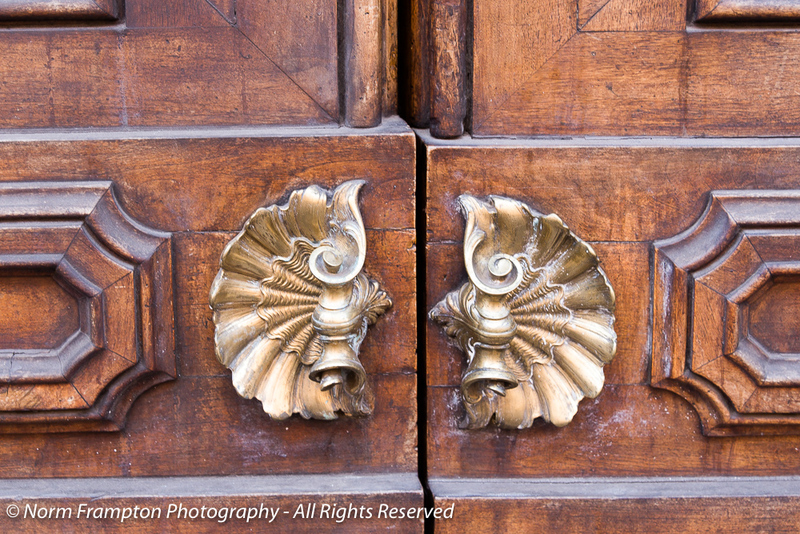 One thing I did notice in Rome and elsewhere in Italy, was the attention to detail in the hardware and accessories. 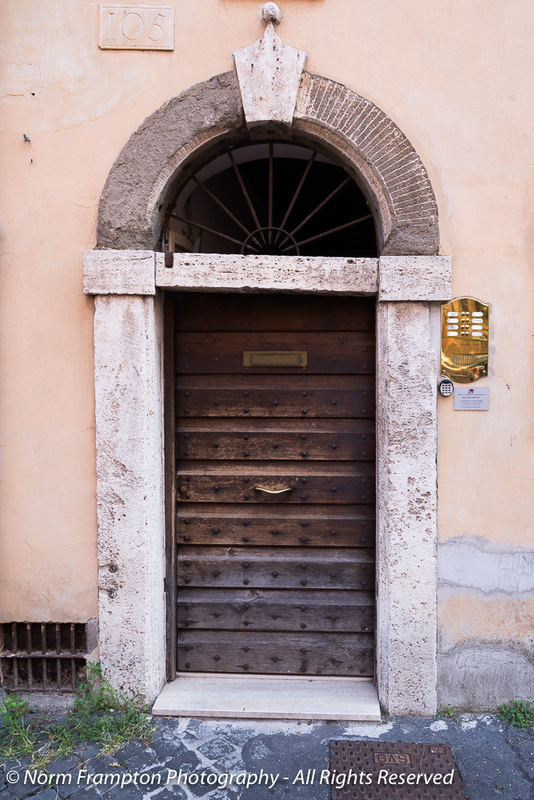 Rome reminded me that when done right, doors and the architecture that surrounds them can be more than just functional. They can be true pieces of art. As always, I thank you so much for visiting. 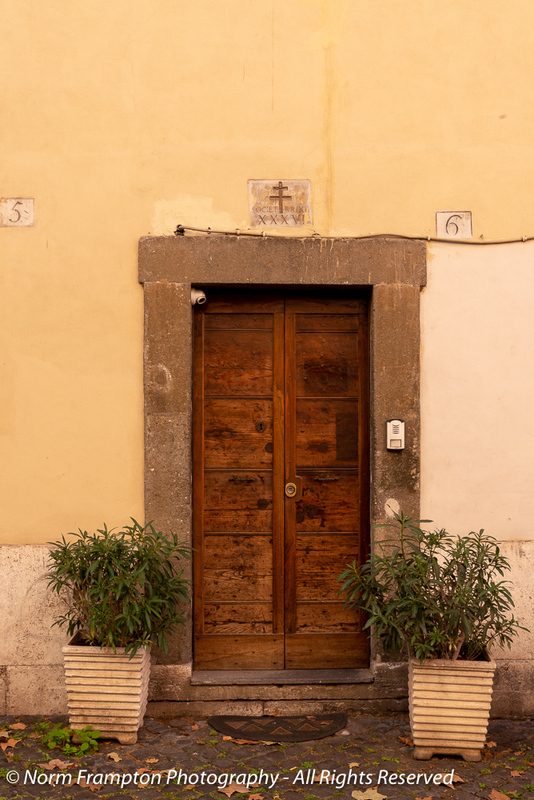 Gallery | This entry was posted in Photography, Thursday Doors and tagged Doors, Doorscursion, Historic Architecture, Historic Buildings, Italy, Rome, Thursday Doors, Tourism, Travel. Bookmark the permalink. All that silent, historical narrative; did you hears the gasps from the readers? Great collection, Norm! I haven’t made it to Rome except for landing at the airport and then taking a train from there to our destination but I met and befriended a lady from Rome when she did her annual vacation on the Amalfi Coast; someday I’ll have to visit Rome and look her up for a doorscursion. Oooh, that dragon knocker. I might go to visit, just so I could use that beauty! I also love the door with the vines overhead. The fading paint almost looks as though the colour is dripping from the greenery above. Beautiful! Norm, are you doing Thursday Doors this week? It’s Thanksgiving in the US, but I know it isn’t elsewhere. Just working on posts and scheduling, so I thought I’d check. Thanks! Hello Janet. Yes I will be doing Thursday Doors on American Thanksgiving. As usual, some stunning doors there. 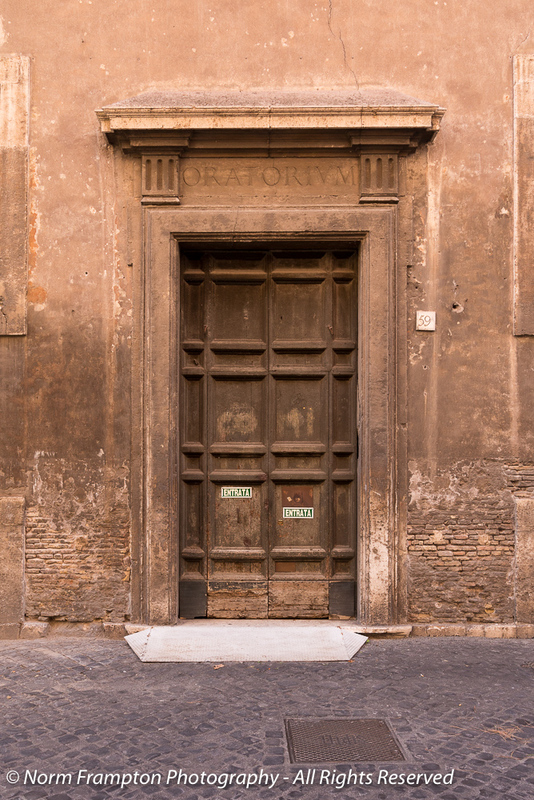 I particularly like the oratorium door. No. 2 was wonderful, definitely tops, cause letter slot but you I bet you suspect my favorite is the patina green with the vines I loved on IG. That could be MY door. Course it needs terracotta pots and a stray cat, but otherwise, it’s perfect for me. I have been meaning to ask you, as you’re from Nova Scotia, if you are fascinated with Oak Island and it’s history? I knew you were from Montreal. I just had all your door posts from Nova Scotia in my head. 🙂 For history buffs, this island is fascinating. Your friends are probably familiar with the stories. A wonderful door collection, Norm. The green one with the large, open iron work caught my eye. And then the knockers- wow! That dragon takes the cake. Oh! That hardware and woodwork! Oh! 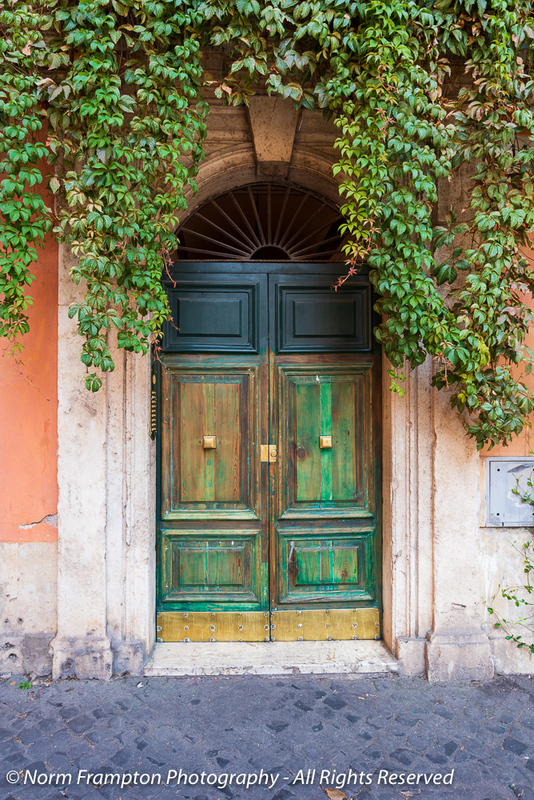 That greeny-bluey door! 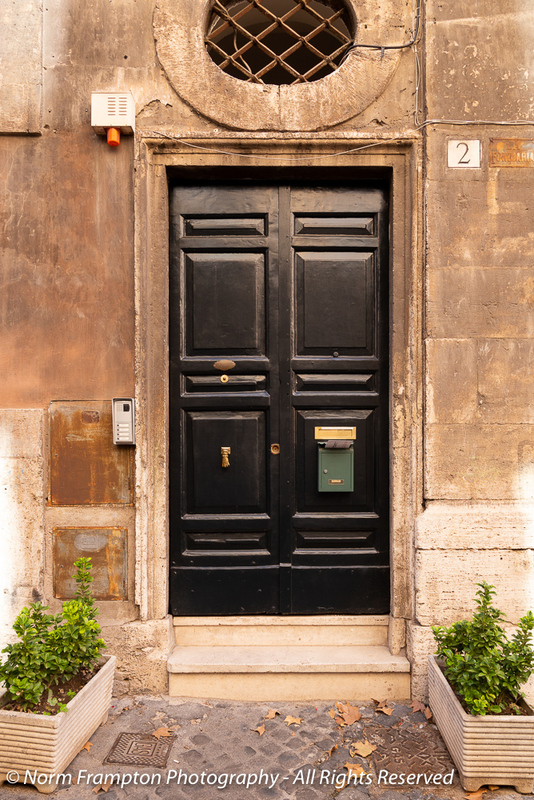 Thank you for the wonderful door-tour of Rome! Love the first door and other doors. I love the hardware too. I wish we had that kind of hardware in the US. Wow! What a beautiful collection of doors! And those details are beautiful. Rome is the best! Thanks Angela. Yes Rome is something special. 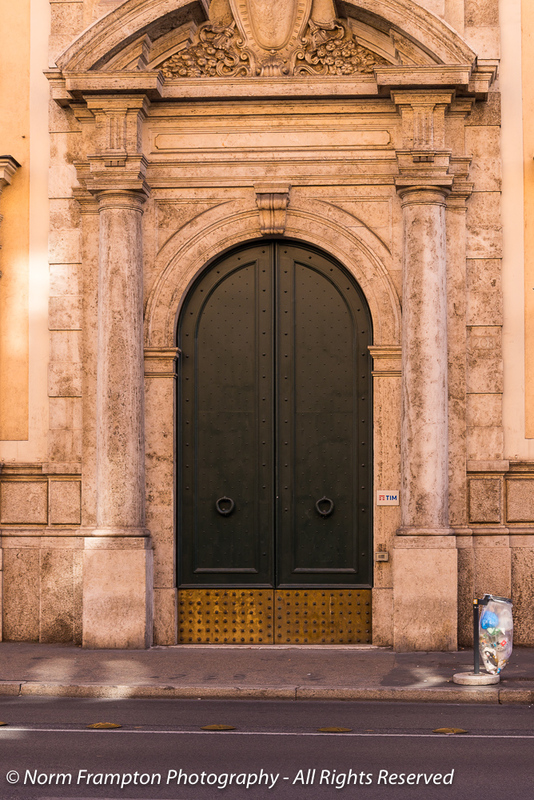 More incredible doors in Rome, and so much detail. 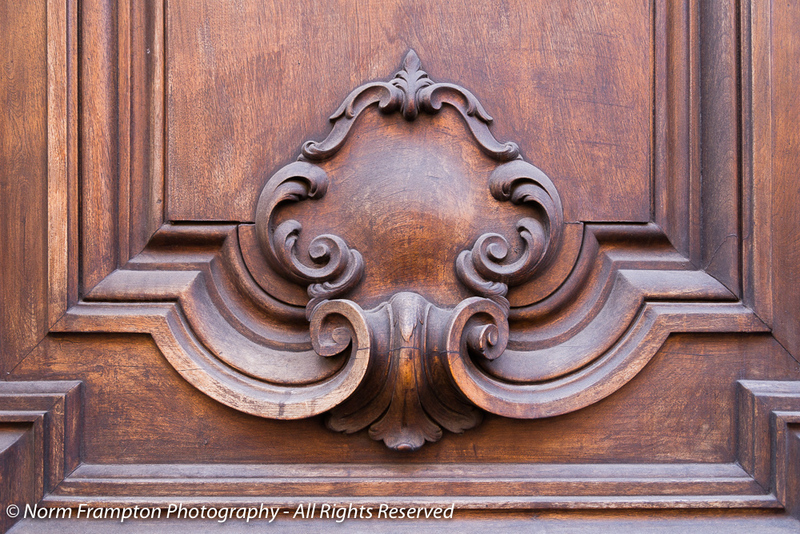 What a lovely way to enter a building or your home. They’ve got it right. My favorite door is the first one taken in shadow. Love that multi-colored door! I’m always amazed that you manage to catch a time when no one’s coming and going! Ho-ly!! 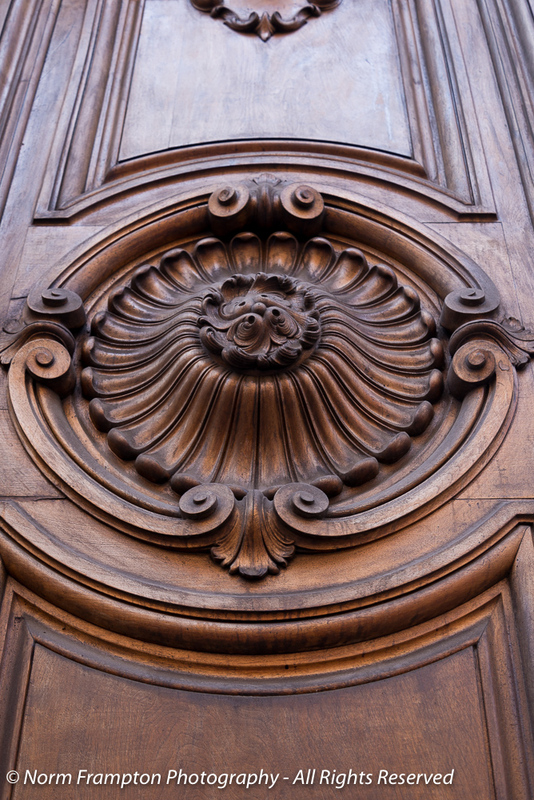 So many beautiful doors. Love the light across the first one. And I think I recognize one of those door knockers! 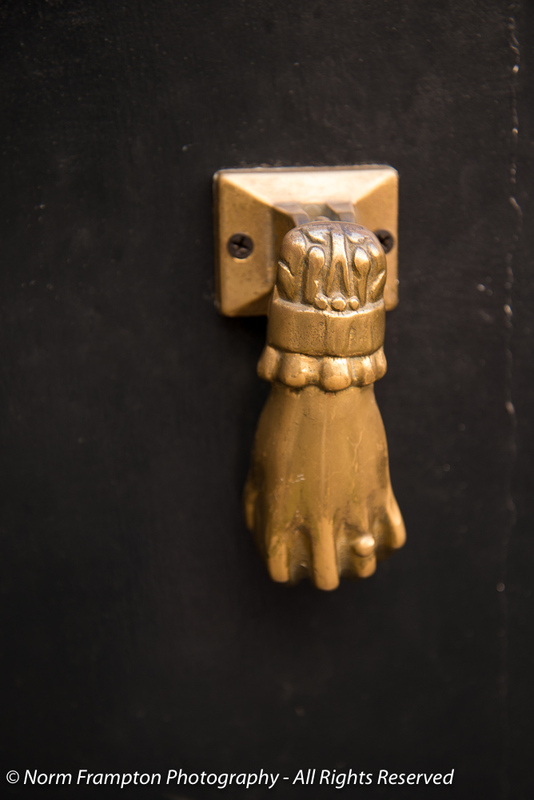 You mean the hand knocker? If I’m not mistaken, I seem to remember seeing one like that in Lunenburg. I want a dragon or hand doorknocker thingy! Very cool. Beautiful doors, but the first design and frame struck me most, as well as the first green door. 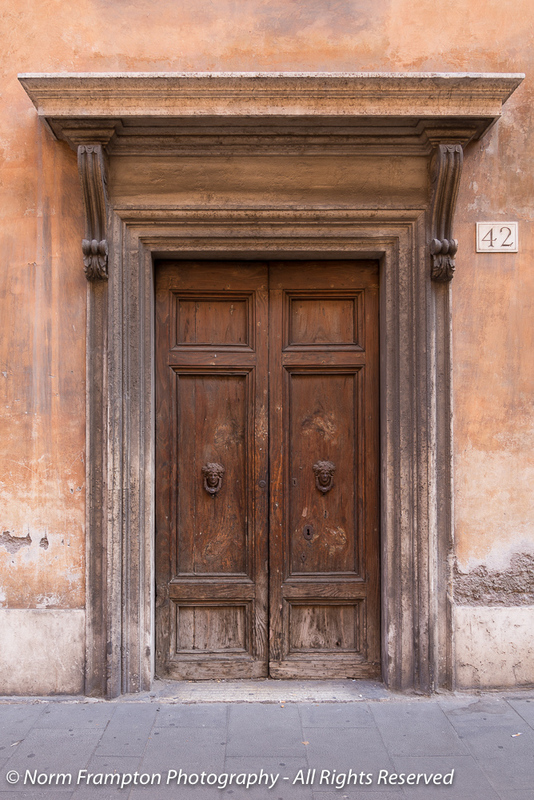 It would be very interesting to know how and for what reason the original owner choose their door! Rome it is! The patina’d door with the ivy, my favorite! Balisima! What’s the word I was looking for? Classical? Wonderful set of doors this week. Without a doubt, the most amazing doors so far. The double door Entrada is intriguing. Some very impressive doors here, Norm. Yes doors are addictive but at least there’s no physical side effects, aside from having to do a lot of walking, which isn’t a bad thing at all. 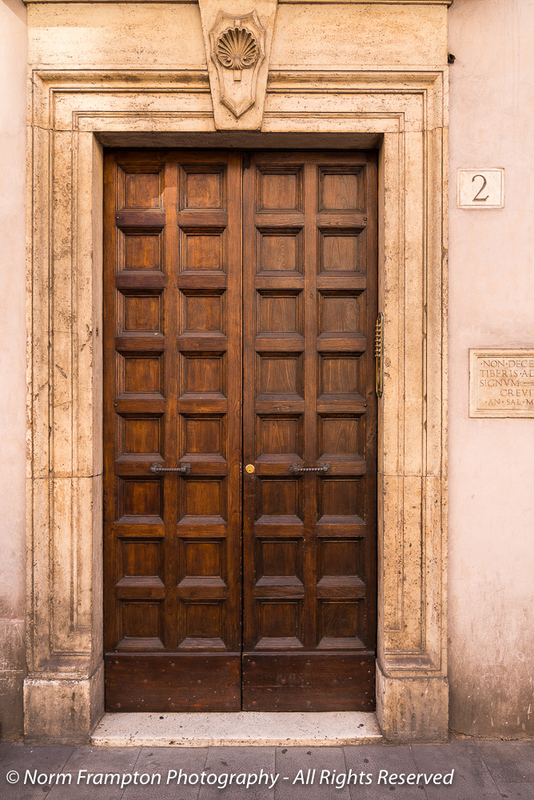 I like the double wooden doors with carved square panels and the shell motif over them. So much detail, so pretty. 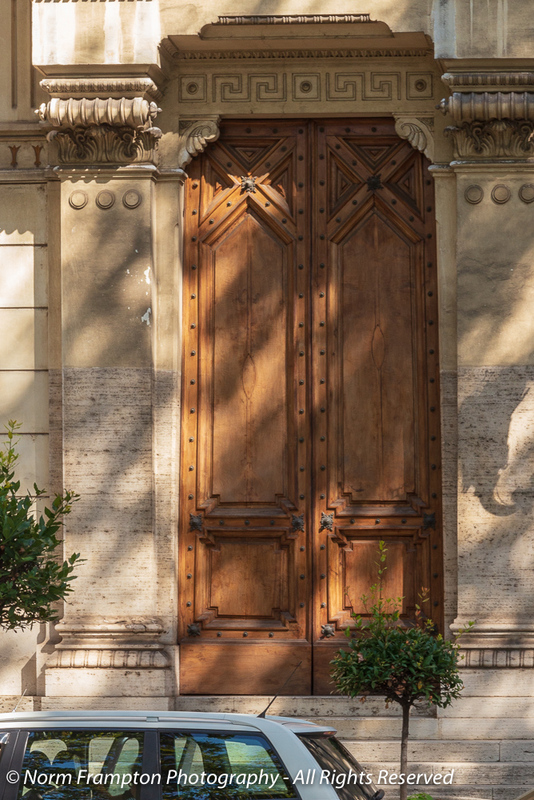 Arched wooden doors, Lion’s head knockers and a spray of light – that door is my favorite, Norm but these are all gorgeous. They appear to have served well and still be going strong. The dragon handle is nice, the hand, um, I might have a hard time with that one, but photo-worthy for sure. You must have been in your glory. It’s like shooting fish in a barrel. 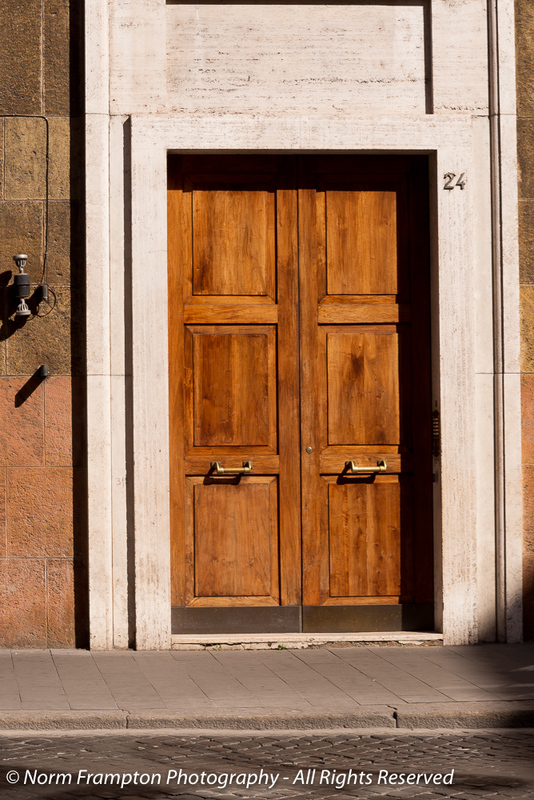 Regardless of where you look, there’s another door worthy of attention. 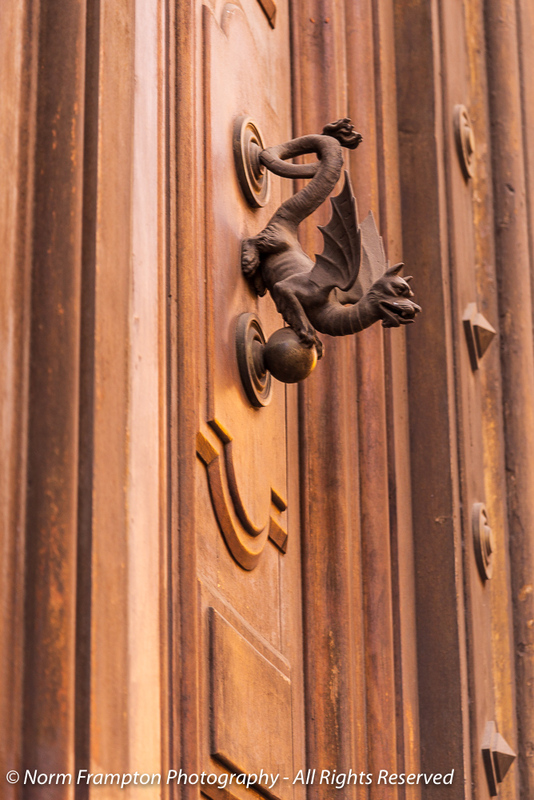 Like Manja, I loved the dragon handle and also the arched green doors with all that great ironwork. Bellissimo!! Those door handles are incredible.